Indonesia is a country that contains 6,000 islands and many diverse peoples. The country has many cultural links to China, India and the Middle East. It is also home to many spices - indeed the Indonesian island of Maluku is sometimes known as "the Spice Island". Most of Indonesia was colonized by the Dutch, who stayed in the area for over 250 years. The region also had extensive contacts with Spanish and Portuguese traders, who left their mark on the region's culture, and also were responsibvle for introducing many crops from the New World. Indonesian cuisine reflects the history of the country and its people. There are dishes unique to the Indonesia, some of which have become popular throughout Asia, and you can also find dishes influenced by Chinese cuisine, Dutch cuisine, Indian cuisine, Malaysian cuisine, Portuguese cuisine, and Spanish cuisine. Bakso Solo - Beef meatballs in a hot and spicy soup containing green vegetables, mung bean thread noodles, and shredded cabbage. Gudeg Yogya - A sweet stew made from young jackfruit and hard-boiled egg. Ketupat - A rice dumpling made by wrapping rice in a palm leaf pouch and boiling. The cooking process compresses the rice as it expands, producing a kind of rice dumpling. Ketupat are sometimes boiled in thin coconut milk and spices. Lumpia Semarang - Springrolls, fried or steam. They usually contain meat and bamboo shoots, and served with fermented soybean sauce. 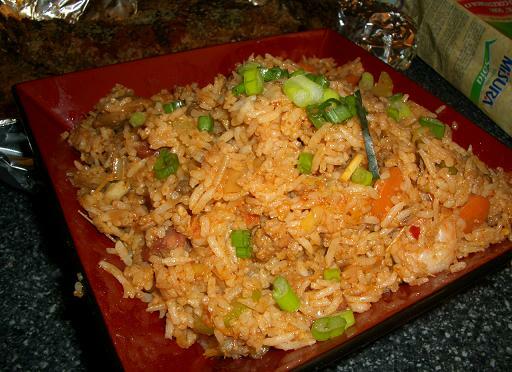 Nasi goreng - This is a fried rice meal. It usually contains vegetables (particularly onion and shallot), egg and prawns, and is flavored with chilli, garlic, soy sauce, and tamarind. Indonesians often make the dish from leftovers, and often eat it for breakfast. Rendang - Beef cooked slowly with coconut milk and spices for several hours. During the cooking process, the meat absorbs spices, the liquid evaporates, and the cooking method gradually turns from boiling to frying. Sometimes the beef may be replaced with chicken, duck, mutton, turtle meat, water buffalo, or even cassava or jackfruit. Chicken and duck rendang is usually cooked for a shorter period than beef rendang, and is flavored with tamarind. In Indonesia, rendang is served with rice. Sate - Diced meat (beef, chicken, fish, goat, mutton, or pork) on bamboo skewers cooked on a charcoal grill. 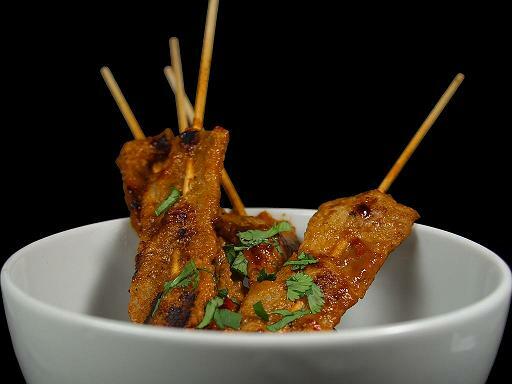 Sate Ambal - Chicken with ground tempeh (a soybean product), chilli and spice. Sate Ampet - Beef and cow offal with hot spices. Sate Babi - Pork sate. Sate Belut - Eel sate. Sate Blora - Chicken with peanut sauce. It is usually served with rice and a soup made from coconut milk and herbs. Sate Bulus - Sate made from soft shell turtle (bulus). It is served with pepper, shallots and sweet soy sauce. Sate Buntel - A large sate made from fatty beef or goat meat. Sate Kuda - Sate made from horse mat with pepper, shallots and sweet soy sauce. Sate Kulit - A crispy sate made from chicken skin. Sate Lilit - This dish is popular on Bali. It is made from ground beef, chicken, fish, pork or turtle meat which is mixed with coconut and shallots and flavored with lemon juice and pepper. Sate Madura - Chicken or mutton with a distinctive sweet black sauce. Thinly sliced shallot and plain sambal are typically used as condiments. Sate Makassar - Beef offal marinated in a sour suace. Sate Padang - Cow or goat offal which is boiled and then grilled. A yellow sauce containing turmeric and other spices is used during the grilling process. Sate Ponorogo - Chicken with peanuts and chilli sauce. Eat skewer normally contains a single piece of chicken meat rather than several slices or chunks. Sate Pusut - Ground beef, chicken or fish with coconut and spices. Sate Susu - Spicy beef brisket, served with hot chilli sauce. Sate Tegal - Goat meat. Usually four chunks of meat are used per skewer, one of which is either fat, liver or kidney. The meat is not marinated, but the dish is served sweet soya sauce, chilli, green tomatoes and rice. Sate Telor Muda - Sate made from immature chicken egg (an egg removed from a slaughtered chicken before the egg had been laid). Sate Torpedo - Sate made from marinated goat testicles. Soto Kudus - A soup made from beef, chicken or mutton, and flavored with turmeric. Srabi Solo - A pancake made from coconut milk and rice flour. Swikee Purwodadi - A soup made from frogs legs and fermented soybean. Timlo Solo - Beef and vegetable soup. Cook delicious and surprisingly easy dishes with this beautifully illustrated Indonesian cookbook. The fabled Spice Islands of Indonesia encompass the most astonishing physical and cultural diversity in Asia. Authentic Recipes from Indonesia introduces a sampling of the most popular Indonesian food from across the archipelago. Included in this unique collection are spicy Padang favorites from West Sumatra, healthy Javanese vegetable creations, succulent satay and poultry dishes from Bali and Lombok, and unusual recipes from Kalimantan and the eastern isles of Flores and Timor. In addition to the range of exciting recipes, this book acquaints readers with Indonesia's varied cultural and culinary traditions. Increasing numbers of travelers are discovering the rich cultural diversity of Indonesia, venturing off the beaten Bali-Java-Sumatra tourist track. Let Authentic Recipes take you on a voyage of culinary discovery, exploring the unknown and revealing more about the already familiar. Today, Indonesian food is well-known for its fried rice or nasi goreng; its satay, the local version of the Arab kebabs; its beef rendang, chili condiment or sambal, and tempeh or roasted soybean cakes. Indonesian cuisine is as varied as its culture. With the world’s fourth largest population made up of 250 ethnic groups and spread out over 6,000 populated islands, Indonesia, as can be imagined, is a land of huge diversity. The archipelago once lay along the ancient trading routes between the Middle East and the Far East, a position that opened it wide to the influences from many far-off places. There are many similarities between Malay food in Malaysia and Indonesian cuisine, but to the experienced palate the differences are just as noticeable. As with the rest of Southeast Asia, rice is the staple diet in Indonesia, except in Irian Jaya and Maluku where people sustain themselves with sago, which is a type of tapioca, sweet potatoes and cassava. Rice is usually eaten plain, combined with a meat dish, a vegetable dish, a sambal and crunchies like fried peanuts or fried anchovies. Sometimes, the rice is steamed in woven packets of coconut leaves to make what is called a ketupat; and sometimes it is steamed in banana leaves and served as lontong. In Indonesia, it is common for dishes to be cooked ahead of time and later eaten at room temperature. This seems to suit Indonesian families, many of whom do not have set meal-times. This practice is also common in restaurants and public eating places in Indonesia. Most Indonesian food is moderately spicy with a predominance of ginger, garlic and fresh turmeric. LEARN MORE TODAY ABOUT INDONESIAN FOOD AND CULINARY TRADITIONS ! Just when you thought you knew everything about Asian food, along comes James Oseland’s Cradle of Flavor. Oseland has spent two decades exploring the foods of the Spice Islands. Few can introduce us to the birthplace of spice as he does. He brings us the Nyonya dishes of Singapore and Malaysia, the fiery specialties of West Sumatra, and the spicy-aromatic stews of Java. Oseland culled his recipes from twenty years of intimate contact with home cooks and diverse markets. He presents them here in easily made, accessible recipes, perfect for today’s home cook. Included is a helpful glossary (illustrated in color in one of the picture sections) of all the ingredients you need to make the dishes and where and how to buy them. With Cradle of Flavor, fans of Javanese Satay, Singaporean Stir-Fried Noodles, and Indonesian curries can finally make them in their own kitchen. Get your copy of the best and most unique Indonesian recipes from Chef Maggie Chow! 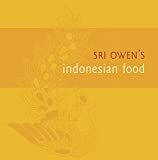 In this book we focus on Indonesian Cusine. The Easy Indonesian Cookbook is a complete set of simple but very unique Indonesian recipes. You will find that even though the soups and stews are simple, the tastes are quite amazing. Pick up this cookbook today and get ready to make some interesting and great tasting Indonesian dishes! 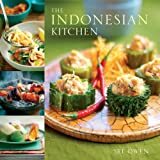 Presents over one hundred twenty recipes for diverse Indonesian dishes, with introductions that provide cultural and regional context for the recipes. The appeal of Indonesian cuisine could very well be due to its cultural diversity and the rich use of spices. From savoury fried rice, richly indulgent meat stews to tantalizingly sweet desserts, this bounty of more than 100 recipes includes all the classic favourites from various regions in the Indonesian archipelago. Apart from providing detailed instructions on how to reproduce authentic flavours using traditional cooking methods, established chef and author Heinz von Holzen also explores the use of modern techniques that can produce equally desirable flavours with amazing results. These methods make use of equipment and ingredients that are easily within reach, some of which could already be available at home.